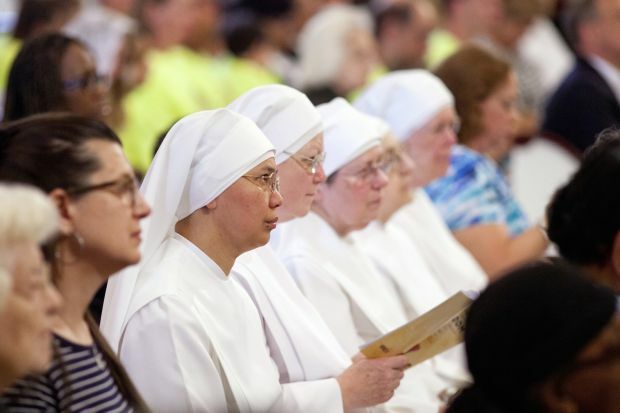 DENVER (CNS) — The Little Sisters of the Poor and other religious entities are not substantially burdened by procedures set out by the federal government by which they can avoid a requirement to provide contraceptive coverage in health insurance, the 10th U.S. Circuit Court of Appeals ruled July 14. In a lengthy opinion that considered arguments raised by the organizations under First Amendment religious rights protections and under the Religious Freedom Restoration Act, the court said the groups are not substantially burdened by filing out a form or notifying Health and Human Services via email or a letter that because of their religious-based objections to the mandated coverage, they will not provide it. The ruling is the latest in a string of circuit court decisions finding that nonprofit religious institutions may not be protected from the procedures set out by HHS from complying with what is known as a mandate to provide coverage for a variety of types of contraceptives in employee health insurance. “The departments have made opting out of the mandate at least as easy as obtaining a parade permit, filing a simple tax form, or registering to vote — in other words, a routine, brief administrative task,” wrote Judge Scott M. Matheson Jr. He was joined by two other judges in parts of the ruling. However, Judge Bobby Baldock dissented from the majority’s decision that self-insured nonprofit religious employers are no more substantially burdened than those with other types of insurance. Under the Affordable Care Act, all health insurance plans are required to provide contraceptive coverage. Churches themselves and other institutions that primarily employ and serve members of the churches are exempt. Nonprofit religious entities such as church-run colleges and social service agencies are not, but HHS created what is known as an “accommodation” under which such organizations may file a particular form or notify HHS that they will not participate for religious reasons. The contraceptive coverage is then provided to those organizations’ employees, but through third parties, and with no cost or further involvement to the employer. Entities that refuse to comply with the mandate are subject to significant fines. The organizations that sued say that the acts of filling out the form or notifying HHS are a substantial burden on their religious rights because the steps implicate them in the ultimate provision of contraceptives. The court disagreed. In addition to the Little Sisters, who operate homes for the aged, the ruling affects Christian Brothers Services and Christian Brothers Employee Benefit Trust, the Catholic ministries through which the Little Sisters obtain their health coverage, and included challenges to the procedures filed by Southern Nazarene University, Oklahoma Wesleyan University, Oklahoma Baptist University, Mid-America Christian University, Truett-McConnell College and Reaching Souls, an Oklahoma-based a non-profit corporation founded by a Southern Baptist minister that trains pastors and evangelists and provides care to orphans in Africa, India and Cuba. Matheson’s ruling took into account the Supreme Court’s June 2014 Hobby Lobby decision, which found that the owners of the for-profit chain of crafts stores had a legitimate claim that their religious beliefs are burdened by the mandate for contraceptive insurance. Matheson said that unlike in the Hobby Lobby case, the federal government had provided a process of accommodating the plaintiffs’ religious objections to the requirement for contraceptive coverage. The accommodation makes the situation unlike typical cases brought under RFRA, he said. In Hobby Lobby and other recent RFRA cases, “the government either required or prohibited acts of religious significance to the plaintiffs. In the cases before us, the government has freed plaintiffs from the responsibility to perform the act they consider religiously objectionable — namely, providing contraceptive coverage. “Nonetheless, the plaintiffs argue an act they do not consider objectionable in itself — completing a form or writing to HHS — becomes objectionable because it either causes the provision of contraceptive coverage or renders them complicit in the provision of contraceptive coverage. Therefore, unlike the aforementioned cases, we are in the slightly different position of considering whether an otherwise unobjectionable act, understood in context, constitutes a substantial burden on plaintiffs’ religious exercise.” It does not, the court concluded.